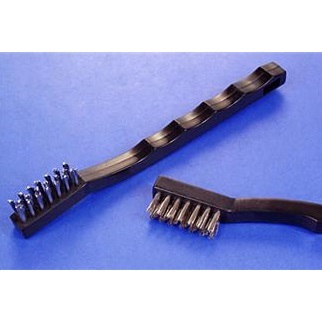 Fine wire bristle brushes clean needle files, saw blades, drill bits, etc. Remove rust, tarnish, baked on dirt and 'scratch' metal for better solder adhesion. Ideal for all miniature work. 1/2 inch long bristles. Molded polypropylene handles. 7 inches long. Set of 2.